Cincinnati has been the home to many breweries throughout its history, one of those being the John Hauck Brewing Company. John Hauck was born in Germany in 1829 and moved to America when he was a child. After completing school and returning to Europe for a few years, Hauck came back to America and worked for his uncle in a Philadelphia brewery. He eventually moved to Cincinnati and began his own brewery with John Windisch in 1863, called the Dayton Street Brewery. The brewery was located on Dayton Street close to the Miami-Erie Canal, which they used to fill the steam boilers, providing power to the machinery. In the first year of business, the Dayton Street Brewery produced 10,000 barrels of beer. By 1881, they were producing 160,000 barrels of beer and had become Cincinnati’s second largest brewery. John Hauck bought out Windisch’s shares of the company and renamed it the John Hauck Brewing Company. By 1884, the brewery was covering the entire city block bounded by Central Avenue, Dayton Street, York Street and Kewitt Alley. Hauck’s brewery was highly successful and he rose to prominence as one of Cincinnati prominent brewers. Hauck was a big supporter of the community and supported Cincinnati institutions, such as the Cincinnati Zoological Society. Hauck was also president of the Western German National Bank in Cincinnati. 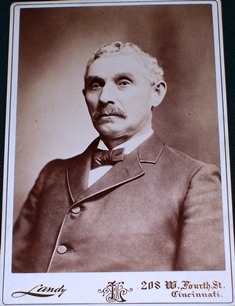 Louis Hauck, John’s son, took control of the brewing company in 1893. John Hauck died in Newport, Kentucky in 1896. The Hauck residence on Dayton Street remains and is owned by the Cincinnati Preservation Association. Join us on November 8, from 5 pm – 7 pm as we celebrate local Cincinnati brewers during our Beer Tasting. Tickets are $20 for museum members and $25 for non-members.